Tired of your outdated bathroom? Looking for new ideas and ways to modernize old counters, floors, cabinets and more? Let this powerful software help you create and design the beautiful, functional bath you've always wanted. Be it a complete remodel or a quick makeover, Virtual Architect’s software gives you everything you need to get started today! No Design Experience Necessary – Facing a remodel can be a daunting experience but Virtual Architect’s software makes it easy using a wizard- driven interface. Visualize your new deck mounted, integrated or free-standing bathtub. Get Started Fast – Easily upload photos of your current bathroom or use the bathroom design wizard to outline and create the room you've always imagined. Virtual Architect’s software allows you to see what the finished project will look like before you start construction. Select Materials Easily - Choose from an extensive bathroom materials library. Bathroom Ideas – Need ideas for matching favorite materials? No problem. From traditional to contemporary, Virtual Architect bathroom design software is fully loaded with great design ideas for an impressive new space. 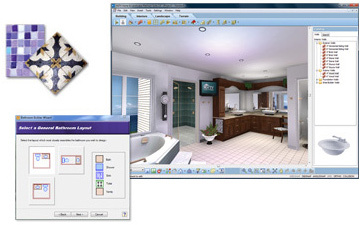 Photorealistic 3D Views – Virtual Architect’s powerful bath design software lets you take a virtual tour and experience your newly created bathroom in brilliant 3D! Your New Bathroom is just a Click Away!